So stocks have had their steepest nosedive in seven years, and with the whipsawing market we’ve seen since, you might—might—be entertaining the knee-jerk urge to sell. I have one word for you: don’t. First, let’s look at why this panic happened, and where things go from here. Of course, for everyday folks counting on stocks and bonds to fund their retirement, seeing a 4.6% drop in a day is horrifying—especially if you remember 2008, when such drops were the beginning of a horrific bear market that ended with a 50% decline in stocks. There’s also the dividend issue. At the bottom of the 2009 crash, investors who bought got a 3.9% dividend yield. Their current yield on cost? An unthinkable 6.9%. That’s the power of being greedy when the market is fearful, as Warren Buffett likes to say. Still, the selloff did happen, and we need to understand why it did. Remembering that short-term price movements are a “random walk”— they can’t be predicted and don’t indicate anything beyond flows of capital in and out of the market—we do occasionally see herd mentality, where selling begets selling, turning a small correction into a crash. That’s obviously what’s happened now. And why it’s happened now makes sense. Remember when the S&P 500 (SPY) did this in less than a month? A Full Year’s Gain … in 4 Weeks?! 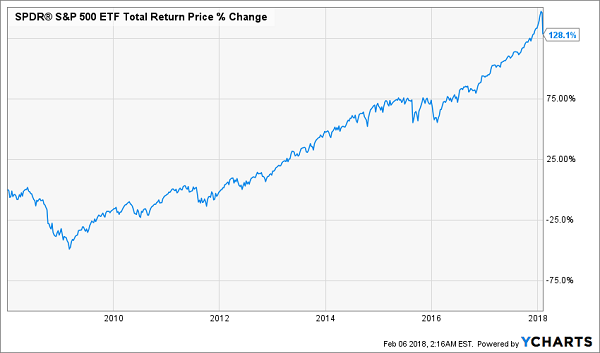 A 7.4% return is decent for the S&P 500 in a year—a gain like that in weeks is madness! Remember the news stories in the middle of January about how the market’s sudden gains meant the S&P 500 reached analyst’s targets for the entire year in just two weeks? 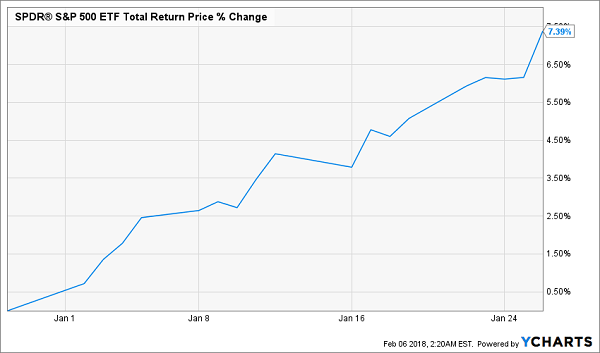 On January 17, CNBC wrote, “Stock market’s rapid rise already surpassed full-year forecasts.” Of course, some investors saw this as an opportunity to take profits and did so. Come February, a few people saw that profit-taking, got nervous and started selling. Which made more people nervous, and they started selling more. Which made even more people nervous, and … you get the idea. Some analysts also point out that algorithm-trading programs (computers buying and selling stocks automatically) may have magnified the selloff, while others note that the Federal Reserve’s plan to hike interest rates three times in 2018 could be a factor. While the computer story makes sense—we’ve seen this before—the Fed also hiked rates three times in 2017, when the market was less certain the central bank would do that, and stocks rose over 25% on the year. So computers may be a culprit, but the Fed argument is a little thin. A more important factor isn’t computers or big financial institutions. As boring as it sounds, mom-and-pop investors may be the culprit. The friends and family telling me they want to sell are the tip of the iceberg, resulting in cashed-out retirement funds, while the smart money shrugs. In other words, this is a really bad time to sell. The truth is, there is so much good news about the economy that it’s almost impossible to go through it all. That’s a big difference from 2008, when a recession was already underway. Now, however, there’s an exhaustive list of impressive stats. For starters, unemployment collapsed to just 4% by the start of 2018, the lowest rate since the 1990s. Wages are up over 3%. Inflation, meanwhile, remains low—prices on all items, including food and energy, rose 2.1% in 2017. When wages rise faster than inflation, Americans have more money to spend on discretionary items. That’s a big reason why consumer spending grew at its fastest rate since 2009 last year, and almost all economists expect it to grow as quickly in 2018. This isn’t all that’s going on. I recently wrote about demographic trends that are good for the economy, as well as the “wealth effect” that’s already caused consumers to spend more. The takeaway? There are too many positive stories in America’s economy for a stock market crash to last. Then there are corporate earnings, which look strong nearly across the board. According to FactSet, more S&P 500 companies reported revenues above estimates (80% in total) in the fourth quarter of 2017 than ever before. Meanwhile, three-quarters of S&P 500 firms reported earnings above expectations. And don’t forget the revenue story: sales are up 7.5%. Again, this is very different from 2008. When that bear market started, worries about bank failures, inflation and low wage growth were hitting the press. In total, S&P 500 companies have so far reported 13.4% earnings growth, and no sectors in the index are reporting declines. Also, that earnings growth rate is faster than the rate we saw in 2017. 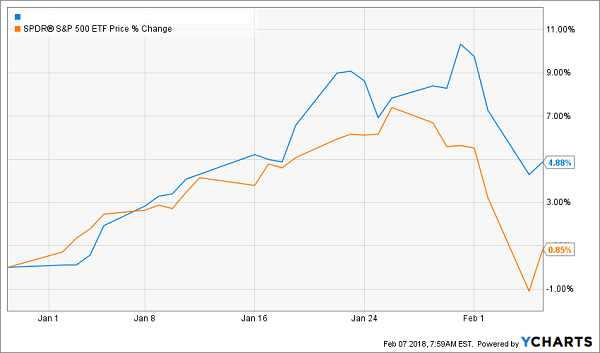 I told readers at the start of the year to look out for earnings growth—analysts were expecting about an 8% increase in S&P 500 earnings in 2018, so the 13.4% gains we’re seeing now are getting stocks off to a good start to meet that target. With strong earnings and sales growth, the selloff has made stocks even cheaper, despite a lack of worrisome indicators in companies’ balance sheets and income statements. Here’s something else you need to know about the selloff: it’s juiced the dividends on my 4 favorite CEFs to buy now! Take my latest addition to this esteemed list. 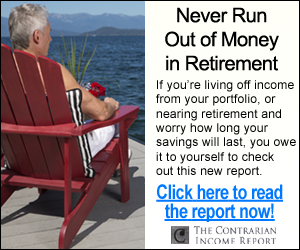 It’s a stock fund that now throws off a SAFE 9.6% dividend! So if you drop, say, $100,000 into this cash machine, a full $9,600 would boomerang straight back into your pocket in the first year alone. The bottom line? Thanks to its shrewd management team and rock-bottom valuation, this one has easy 20%+ upside in the next 12 months, in addition to that fat dividend yield! That’s right—we’re looking at a 30% gain ahead by this time next year here. These are the kinds of returns you can find when you cut emotion from your decision-making and buy when everyone else is freaking out. 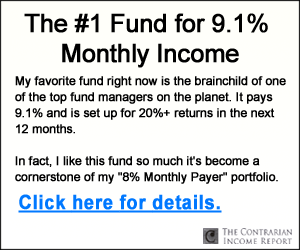 I’ll show you the name of this fund right now when you click here. I’ll also reveal 3 more funds that have seen their discounts widen and their yields spike (I’m talking an 8.1% average payout), courtesy of this irrational selloff. They were great buys before … but they’re terrific buys now! Don’t miss this unique chance to profit. CLICK HERE to get the names, ticker symbols and my complete research on these bargain CEFs now.